CATHARSIS: Monday Motivation: How Do I Move On? I've had my share of heartbreaks, one of which made a scar so deep it reshaped me in significant ways. And I'm grateful for it and don't regret anything about it. After all, anyone who has loved has had their heart broken one way or another. 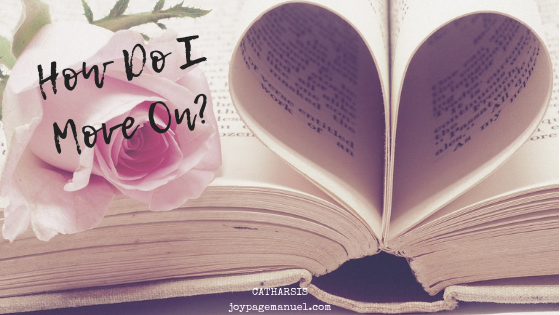 A question I hear often, and one that took me years to answer is this: How do you move on? The answer is quite simple, but it's not easy. Even I had such resistance to it when it first dawned on me. However, once you accept it and are willing to do the hard work required, I promise you will experience the liberation and growth you truly deserve. You move on by knowing in your heart and truly accepting that you deserve something else, something or someone better. The clinging and the holding on are reflections of your belief that you are not worthy of someone or something else; that you have lost that which was perfect or perfectly-suited for you. We cling because we are choosing to believe that the happiness we felt was a fluke, a once in a lifetime cosmic event that can never be experienced any other way and with any other person. We keep holding on to a past love or relationship because we believe that there is scarcity of love and good, and that our past is what we fully deserve. These are false beliefs and ones that are spoken by a wounded 'self' filled with fear. But to move on, you need honesty to accept that you deserve something else than what has already ended. Be honest in your post-mortem. Don't dismiss any gut feel or red flag you might have noticed but chose to sweep under the rug. Remove all blinders and challenge all illusion, and I guarantee that you will see truth more clearly: that you deserve better; that love and good are not scarce; and that your sense of worth is what truly needs your attention right now.